The dominance relations of alleles can be in many ways, resulting in different phenotypic effects in different allelic combinations. 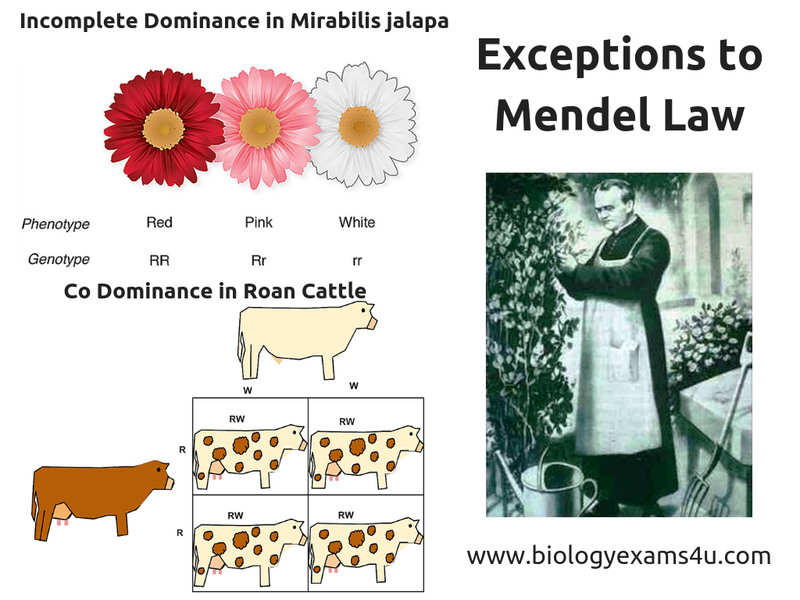 The main objection to the Mendel’s principle of genetics was incomplete dominance. Correns discovered incomplete dominance.It is the phenomenon where dominant alleles do not completely express itself. This phenomenon was first studied in flower colour of Mirabilis jalapa or Four O’clock plant. 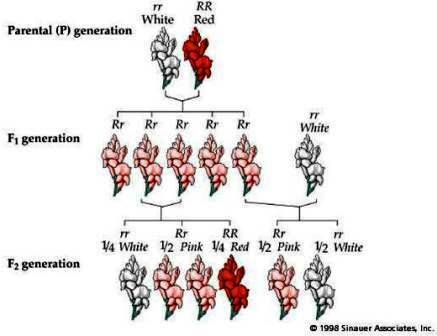 In this plant, red flowers are incompletely dominant over white flowers, the heterozygotes being pink. When blue Andalusian are crossed among themselves, they produce splashed white, blue and black offspring in the ratio 1:2:1 due to incomplete dominance. The phenotypic and genotypic ratios are the same in this case. When the heterozygote exhibits a mixture of phenotypic characters of both homozygotes. In shorthorn cattle, alleles for red and white coat colour occur. Crosses between red (r1r1) and white (r1r2) coat. A close examination of hairs of roan animals reveals that the coat is made up of a mixture of red hairs and white hairs. Here co-dominance occurs, rather than intermediate dominance.